We are all bound by them, whether we are fully aware of them, or not. And whether we like it or not. Some of us are bound by them more than others. Women are bound by the chains of gender and the way it's been constructed over centuries. You may feel free of it and then a barrier comes up to doing something you want to do, or a comment is made that reminds you of your gender - and your place in society. Children are bound by the chains of their family, dependent upon parents and carers for not just basic and essential needs but also life giving experiences. Some children have more chains than others. Some live with the burden of generations of chains. Other children live in families where the chains have been broken and they can access the world with some freedom. Some children grow into teenagers who throw off the chains, break through them and don't allow them to hold them back. Doing what they want regardless of the chains others try to restrain them with. Sometimes the chains can bring us comfort, a sense of security and containment. Without chains we might do something without thinking it through or without fully understanding the consequences. Some thing that will hurt us or others. 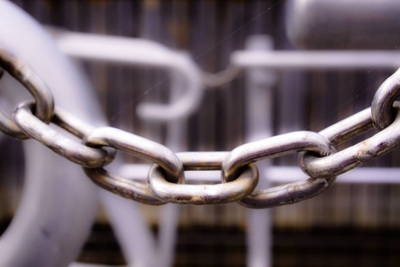 We can use chains ourselves, to our own advantage, to put up a barrier to others. We can stop being hurt or becoming vulnerable by using the chains for protection, choosing when we want to release them.